The Jam Free Dance Project in collaboration with Sadler’s Wells and London Youth Dance which commenced in late 2009, culminated in a number of performances in Spring 2010. 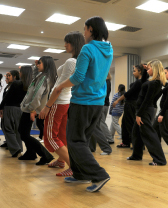 Twenty-four ‘semi-sporty’ girls from a combination of Sheen School, Whitton School and Hampton Community College took part in weekly sessions, learning a fusion of street dance and Latin dance. The retention of participants across the project was exceptional, with almost all of the girls taking part in the final performances. The girls performed alongside other Youth Dance Companies from across London in an informal show at Sheen School, before performing at the Lilian Bayliss Theatre at Sadler’s Wells in March. The girls also performed at RichDance, the borough dance festival. The other strand of the project allowed another group of young people to work with James Wilton, the Blueprint Bursary choreographic winner over the course of a day. James spent a day with 25 KS3&4 boys from HCC developing their own creative choreography based on contemporary dance and martial arts. Through the project we forged strong links with the dance departments in all three schools, and strengthened our relationship with Sadler’s Wells.